Many websites, and most department websites, include one or more directory pages. You must build the page using the Advanced Page Editor, and the row width must be set to full width. If you decide to include photos, consider whether you want to send any portrait guidelines, e.g. head shots, professional dress, simple backgrounds, 72ppi in size, etc. Some departments pick a staff person who is comfortable with photography and assign them to take the photos so they are more consistent. – Portrait photos must be at least 200px or more in width. – If you choose not to include a portrait, an dummy avatar portrait will be displayed instead, unless you hide the profile photos. Gather the information you want to include. Allow extra time if you ask for photos. Service type – accounting, financial, student services, etc. One person can be a member of multiple groups. 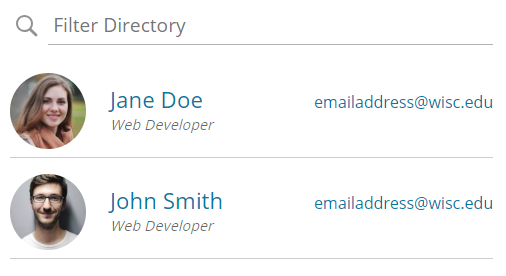 On the WordPress Admin Dashboard (the black vertical menu at the left), locate and click Directory. The Directory block expands to show the options – Directory, Add New, Group. Click Group. The Groups screen appears. Enter a Name for the Group, e.g. Staff. Enter a Slug for the Group, e.g research-staff (use dashes for underscores). Click Add New Group. The new Group appears in the list of Groups on the right side of the page. On the WordPress Admin Dashboard (the black vertical menu at the left), locate and click Directory..Add New. A new screen appears with settings at the left, and the homepage at the right. The Add New Post screen appears. In the title field at the top, enter a first and last names. Choose one or more Groups. 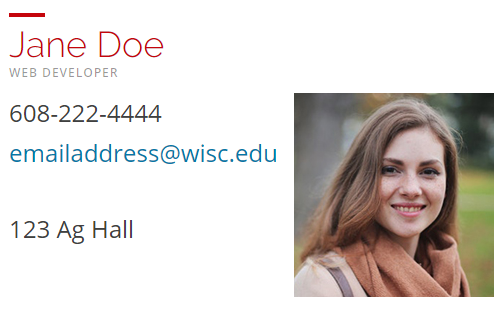 Add a Bio (you can copy and paste from Word if you wish). Add Publications (you can copy and paste from Word if you wish). Add the URL of a LinkedIn Profile. Set the security on the listing by restricting it based on WordPress roles. This allows you to restrict the content so it can be viewed only by people who have current WordPress accounts on the site. You can also set the error message shown to people who do not have enough security privilege when they try to view the list. On the WordPress Admin Dashboard (the black vertical menu at the left), locate and click Pages..Add New. The Add New Page screen appears. In the Advanced Formatting box, click Advanced Content Editor. A Page Content Options box appears. Click Select Content Layout to add a content row and choose Full Width from the popup menu. A Full Width content row appears. Scroll down and click Add Full Width Content. Choose Directory Listing from the popup menu. A Directory Listing content block appears. Choose a Listing Option – List Full Directory, List Specific Groups, List Select Individuals, List All by Groups. Directory Filter – this displays a Search box above the directory. Default setting: Allow Filtering (display the search box). To change the setting, click the white triangle. Show Profile Photos – this displays or hides the profile photos, in the directory listing.